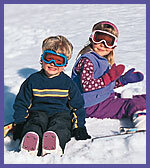 KidznSnow :: KidzResorts: Colorado ski and snowboard family resorts including Vail, Aspen, Beaver Creek, Breckenridge, Steamboat, so many! Most experts agree that Colorado has as many world-class ski areas and ski towns as any other three states put together. The only challenge facing your family is deciding where to go. Read our resort reviews for further information on individual resorts, and begin your exploration of Colorado skiing here. The Closest Areas to the Front Range... These three areas are favorites with skiers in Denver and Boulder, two of the metro areas that make up the front range. While smaller than their big-name sisters and while none have a town or lodging at their base, together they have over 6000 vertical feet of beginner to true expert terrain. Eldora is only 21 miles from Boulder and has a great half-pipe, three terrain parks and tree skiing. Loveland is the closest area to Denver, 56 miles up I-70. It tops out at 13,010 feet and they usually open in mid-October and close in mid-May. Arapahoe Basin is nine miles from Loveland over Loveland Pass, and its top is 13,050 feet. With 40% of the terrain advanced or expert, it might not be the best choice for beginners. Traditional closing date is July 4, making it the best spring fling skiing in Colorado. Winter Park is the big attraction in Grand County, and it's only 85 miles from Denver. It's known as one of the most family-friendly resorts in the country, and is the world leader in providing disabled skiing. The town isn't quite as charming as some, but The Ski Train from Winter Park and Amtrak drop skiers right at the base of the mountain, which is about as charming as it gets. Silver Creek just changed its name to SolVista, but by any name it's the family-specialist resort, but without a lot of expert terrain. Berthoud Pass has only two small chairs but with terrain parks and van shuttles that pick up experts who've skied and ridden the steeps, it's a favorite with rippers and shredders. Summit County's World-Class Ski Areas With three areas the size of Winter Park (each has at least 21 lifts) or larger, plus A-Basin and Loveland (just over the county line) on one side, then Vail and Beaver Creek on the other side of the county line, Summit County is the epicenter of America's world-class skiing. If you want to sample more big-name resorts than you can shake a ski pole at, this is the place (well, together with Tahoe and Park City). Copper Mountain has just built a new village center, and it's the only area its size in the country that has green runs (to the west), blue runs (in the middle) and black runs (to the east) so perfectly segregated that you and your kids can ski with the utmost safety. Keystone has three immense mountains, the most night skiing in Colorado, and a gondola with great mountaintop views (especially at sunset) and fine dining. At five acres, Keystone Lake is the prettiest place to ice skate (and play hockey) in the West. Breckenridge has the most charming, historic town of the three, and they also have the most lifts (25) on three big mountains. Breckenridge also has outdoor ice skating on Maggie Pond at the base of Peak Nine at the northwest corner of town. All three areas have lodging, restaurants, terrain parks, off-snow attractions and children's programs that rival anywhere in the country. Vail has 33 lifts and with 5,289 skiable acres, the most in America, it has over ten times the skiable terrain of an expert's paradise like Arapahoe Basin. The epic back bowls and new Blue Sky Basin are rarely that steep, and they even have a few groomers that any good blue skier can handle. Adventure Ridge with its ice rink, tubing hill and other attractions atop the Lion's Head gondola are a favorite with kids. Beaver Creek, Vail's sister resort, has about a third the terrain and number of lifts, but the vertical and charm are essentially the same. While the base area and village are smaller, they're just as pedestrian-friendly and charming, especially around the outdoor ice rink in the center of the village. Aspen's Ski Town and Four Ski Areas Aspen is where private jets go to breed. For some reason it often seems to have less attitude than the less historic ski towns. Aspen is a beautifully-preserved Victorian ski town, like Breckenridge, Crested Butte, Telluride and even Steamboat Springs, but on a larger scale. Unlike the latter three, the gondola and lifts of Aspen Mountain (now more often called Ajax) come right up from the edge of town. Aspen Mountain is geared to solid intermediates and advanced skiers. Take your kids there when they're into shredding. The mountain is 3267 feet tall but not very wide, and snowboarders will have to wait until after April 2 to explore its' expanses. Aspen Highlands has similar terrain and best left to experts. A new base area makes for better access and enhanced experience. Buttermilk is the smallest and gentlest of the four Aspen areas, but with 7 lifts and 2030 vertical feet it's still a big-time ski area. It's a great area for families with beginners, with legendary kids' programs. Snowmass is even more legendary in every way, with its 4406 vertical feet among the most in North America. They're renowned for having some of the best kids' programs anywhere, but with 7% beginner and 55% intermediate terrain it's the place to go once your kids are skiing the blues. Many families love Snowmass Village, but if you prefer the historic charm of Aspen, you may want to take the shuttle bus over. Three Beautiful, Friendly, Remote Ski Areas If you're into exploring as many ski areas as you can on one trip, then you might consider visiting the areas mentioned above. If you'd like to soak up every bit of one ski area and town as much as you can, I'd recommend each of these more remote ski areas. Each has direct flights to nearby airports, and each can keep you charmed, entertained and even awed for a week, or for years. Steamboat is the biggest of these three world-class resorts. The town of Steamboat Springs is the largest, most Western, most authentic, and I feel the friendliest of all Colorado ski towns. It's much more pastoral and wide open and lacks the Alpine style mountains of Telluride. Its terrain parks, half-pipe, night tubing and kids' programs equal anywhere else, and the Hot Springs Pool (there are five progressively warmer pools) in downtown Steamboat with its long, winding water-slide makes it the coolest - or warmest - pool in an American ski town. Telluride is the most beautiful mountain town - or maybe just town - in America, located at the bottom of an Alpine box canyon with waterfalls and avalanches cascading off huge cliffs up valley. Like Steamboat and Crested Butte, the mountain area is located at least a few miles from town, but in this case they're connected by a gondola that runs well into the night. Telluride might be the most remote ski area in Colorado, but it also might be the most special. Crested Butte combines Telluride's Alpine scenery to the north, with Steamboat's pastoral scenery to the south. The North Face offers the most extreme steep skiing in Colorado, yet half their terrain is for beginners or intermediates.